With the 2017 regular season complete and recent new career marks set, it is a good time to take a look at all of the career lists. The league has provided the top 30 in the five main counting stats. Highlighted players appeared during the 2017 season. After the retirement of Tamika Catchings, no active players are on all five lists as she and DeLisha Milton-Jones are the exclusive members of that list. Four active players, Alana Beard, Candace Parker, Diana Taurasi, and Lindsay Whalen appear on four lists. It was a major season for broken records, and having a new all time scoring leader was certainly part of it as Diana Taurasi leaped past two players to top the top. Sue Bird’s other milestone gained more recognition, but she reached the top ten in this category and was joined by a resurgent Candice Dupree. There are two newcomers on the list as Maya Moore and Sylvia Fowles joined, showing the experience of the Lynx as they have six players on this list, nearly half of the active players. Plenty of movement should be expected on this list next year, especially when Angel McCoughtry makes her return and jumps well past the 5,000 point mark. Tamika Catching set the career mark in this category last season, but her retirement has given Rebekkah Brunson the chance to pass her next year after she moved into the top three and surpassed 3,000 rebounds. 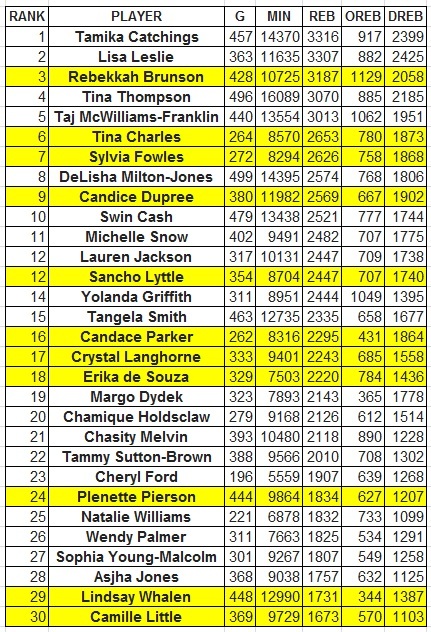 Sylvia Fowles and Tina Charles moved into the top ten, but will have to have great seasons again to reach 3,000 next year. Camille Little is the latest player to join this list. 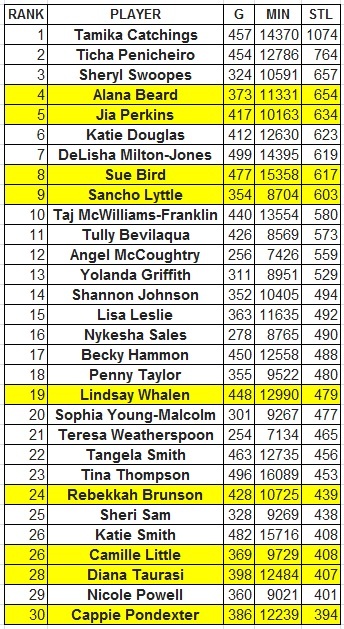 The most recent milestone was Sue Bird’s climb above Ticha Penicheiro for the all time assists mark. This was certainly viewed as a possibility before the season, but really required a second straight big year to accomplish. Courtney Vandersloot was a big gainer on this list this year and a similar performance next year should push her well into the top ten. 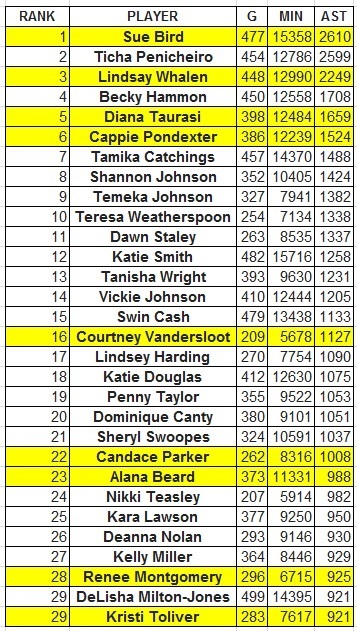 There are three newcomers on the list as Candace Parker surpassed the 1,000 mark and Renee Montgomery and Kristi Toliver also check in at the bottom. It will be a long time before anyone threatens this career record, but there has been plenty of movement. Alana Beard passed several players to reach fourth, but is just shy of Sheryl Swoopes with a question of retirement looming. Sue Bird looks set to move further up this list next season. 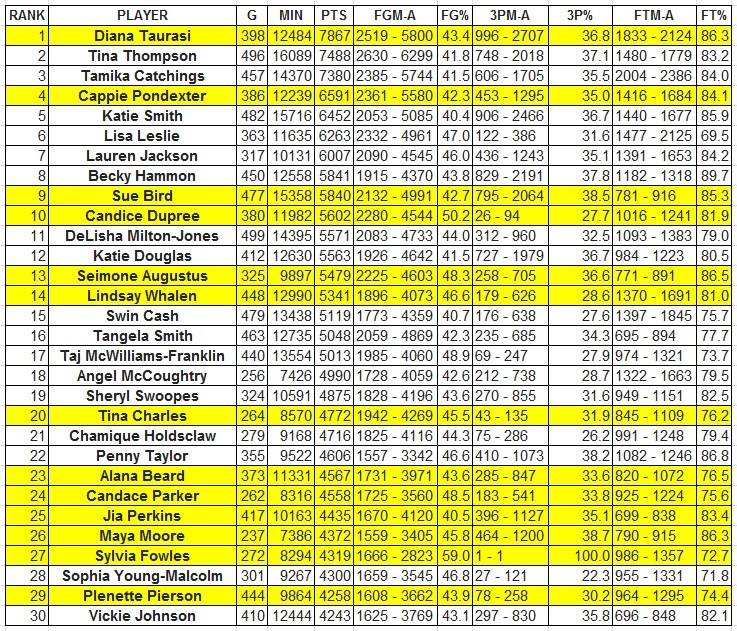 Camille Little and Cappie Pondexter are the newest players to join this list. This is also not currently within reach, but the chase pack is more clearly defined as Sylvia Fowles and Brittney Griner both had strong seasons in this category and could both make it into the top five in a year. 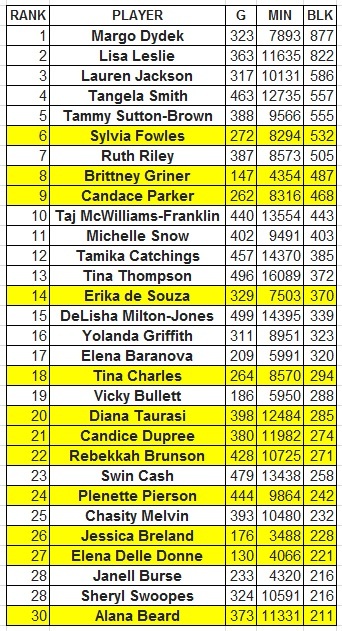 Diana Taurasi is actually still higher on this list than she is on the steals list. Jessica Breland, Elena Delle Donne, and Alana Beard are the newest players on the list, giving Beard membership on her fourth list.